Old Glory appears to float in the darkness that seems to be creeping into our world, suspended only by the cross on which it rests. Its battle colors, tatters and bullet holes speak of the great battle raging for the soul of our nation. Through the symbolism of a flag-folding ceremony, Impressions of Old Glory represents the principles of faith on which our country was founded.The artist began with text to be read at the ceremony and added images representing each fold of the flag. 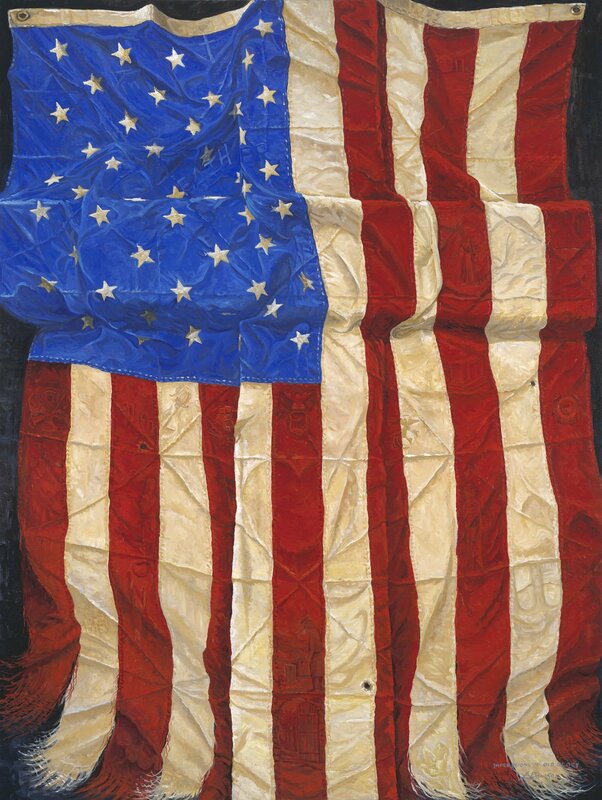 Beginning at the lower portion of the painting and progressing upward, twenty-five hidden symbols depict the meaning of each fold of the flag. In the first fold the baby and blooming flower symbolize life, with eternal life represented by an angel at the Gates of Heaven in the second fold. At fold seven the great Armed Forces that protect our country and flag are honored. There you can find the emblems of our Army, Navy, Air Force, Marines and Coast Guard. When the folding ceremony is completed the stars are uppermost, testifying to our national motto, “In God we Trust.” For a complete explanation of this amazing ceremony and painting, go to jackdawson.com.